Major restoration work has been underway to recover areas of the fortress that have been lost to flooding. The fortress of Rumkale in Turkey is an amazing historical site. Photo credit: shutterstock.com. Following extensive restoration work, Turkey's Roman Castle is set to be reopen for tourism. Also commonly identified by the name Rumkale, the a fortress was built on the Euphrates River throughout Roman and Hellenistic times. Since March 2017, the Roman Castle has been inaccessible following major works at the Birecik Dam and the castle. According to the Daily News, the Gaziantep culture and tourism department hopes to open the Roman Castle to tourism immediately following the restoration works. The effort to restore the castle as a major faith-based tourism center began in 2012 and was projected to cost about 2.5 million Turkish Liras ($707,894.50 USD). The restoration program was undertaken by the Gaziantep Metropolitan Municipality. Restoration and proper management of the Euphrates will benefit the people living in the surrounding area. Some of the sections renovated include the eastern and western gates and the city walls surrounding the castle. Most of the major renovations are complete with just a few areas remaining. The Roman Castle is an ancient fortress on River Euphrates. The fortress served in various functions over the centuries and played a significant role in Christian history. The castle is believed to have been the site where Johannes, an apostle of Jesus Christ, reproduced copies of the Bible. The castle is located between Gaziantep and Sanliurfa cities of Turkey on a hill between Merzimen Creek and the Euphrates. The fortress has been home to various civilizations including the Sumerians, Babylonians, Urartian, Ottoman, and the Seljuk during which the castle has been known by different names. In the past the castle served as the seat of the Armenian empire in the 12th century and it was the dwelling of the head of the reunified Armenian Church. Ottoman Turks converted the St. Nerses Church into a mosque during their reign in the 17th century. The Roman Castle is a remarkable sight. Its natural location amongst rocks and cliffs blends perfectly with the human-made features around the castle. The castle is accessible by boat from the western and eastern entrance. Some of the tourist attractions within the castle include Aziz Nerses Church (built in memory of the Christian patriarch St. Nerses who died in 1773) and the Barshavma Monastery. 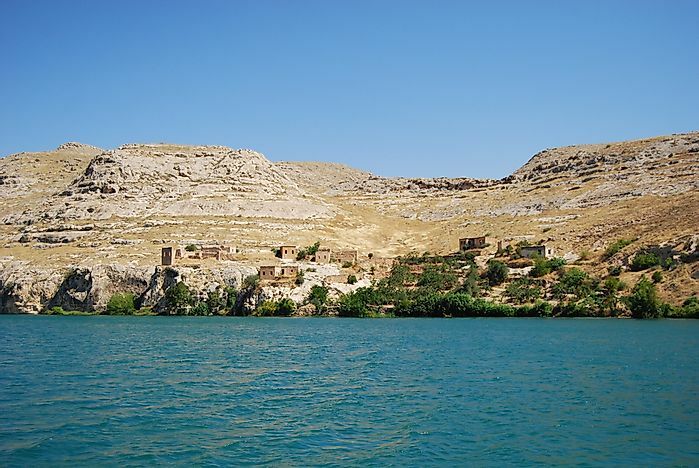 The location of the historical site on the Euphrates provides a great relaxation spot, especially during the spring. Surrounding the castle are numerous villages and farmlands. As an initiative to restore the heritage of the Roman Castle, the British Council Cultural Protection Fund awarded a £99,960 ($130,845.64 USD) grant to the School of Oriental and African Studies. The school is running a project to protect the castle and other historical sites in Turkey. The project will cover a two-year period with the aim of also improving the management of the site in future. After a period of restoration and renovations by the ministry of tourism and culture, the castle is now open for tourists to visit.